Uganda sits in the heart of Africa. 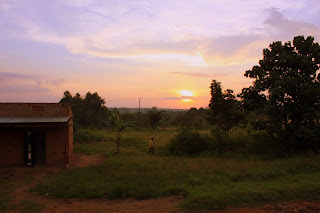 And this place, Gulu, means "heaven." These last few days I have seen God’s prophetic destiny for Uganda begin to be fulfilled. Those of us who have loved and lived in Uganda have felt for a long time now that we were preparing for revival in this place and that what would happen here would touch the whole world. Just as the heart pumps blood to the whole body, so Uganda will pulse out living water to the nations, streams of life for healing. We are beginning to seeing God touch down on earth. At night on the fields of Kaunda Grounds, where Todd Bentley’s team from Fresh Fire speaks from the stage of the destiny of this place…it feels like the fourth of July—that energy, that expectancy, that celebration of something you’ve been waiting for about to break forth from the sky. The Kingdom of God on earth—almost heaven. Some of you may not believe in angels and demons. Some of you may not believe in miracles. I admit, I have a hard time believing myself. I always want proof. I want to know that God’s power has actually changed a life. I’m not interested in healings or signs and wonders for the sake of talking about them---I really want to see a life transformed, a heart healed, an outward manifestation of an inward change. Before I came back home to Gulu, when I was with Heidi Baker’s ministry in Mozambique, I felt God say to me that when I got to Uganda I would begin to see the miracles I had so longed to see. He said that when I entered this place, the authority I carry because of my calling here would bring a greater anointing than what I felt even with some of the greatest ministers of all time. This is the life I have been longing to live—the gospel walked out like in the days of Acts where the blind saw, the deaf heard, and the mad people were freed from spirits of insanity. I have seen. And it is beautiful. I’ve been moving around with a team of Ugandan and mzungu friends from Mbale in Eastern Uganda. They came to get the impartation to bring back with them to their homes. Every day, it seems those who need prayer just find us. First, a woman who was crazy because she is possessed by demons sat behind us in church and she was laughing, as though mocking God. We followed her out and started talking with her and praying for her. Immediately the demons began manifesting. You could actually see the difference in her as they would come up or as she would come up—almost like watching someone with multiple personalities. We led her to faith in Jesus, which took a while because she couldn’t form the words because of the demonic power, but finally we were able to cast them out—firmly, but without the shouting and ridiculous display you see depicted in movies. Afterwards, there was such a change in her---she was no longer angry and antagonistic. We hugged her and she hugged us for a long time and you could feel that she just wanted love because she had experienced so much rejection within the church. Later she came to stand beside me in church with her arm around me and we worshiped together. The power of God was so strong I just felt like weeping. We bought her a bible and some new clothes and spoke to the church about caring for her and left with the lightness of knowing that God had freed someone from their prison. I didn’t know when I began this dream of wanting to help girl soldiers, that it would lead me down this path where I actually get to witness the power of God. What I’ve realized though is that because of the pain that has happened in this place, Satan has taken up residence in so many lives and they need that deliverance along with that love to complete the work of inner healing. A life cannot change if a heart doesn’t change. I realize that this is much bigger than just trauma counseling or living in a safe home—what God is longing to see is people set free—in every way---from sickness and disease, to wounds of the heart so that we can be the true church. And I am getting to be a part of that. It is a dream come true. I want to share one more story that touched me deeply. I’ve seen things the past few days I’ve never witnessed before. We prayed for a mute man who began to speak. It was amazing, but I wanted more….and God answered my prayer and I saw a transformed life. Picture a young little chubby guy in a crowd of people at a crusade where he should be safe from ridicule. They say he is a mad person and that his brother is mad too. Probably a curse. The kids taunt him so he chases them with a stick and running and screaming erupts in the crowd. We see the pandemonium because it is close to us and we see him yelling at another boy, angry and belligerent. We make our way over to him and speak kindly, all the while praying and speaking peace over him. He calms, even though he stares straight ahead. We tell him we want to help him and ask if he wants us too. He nods so we tell him we want to fight the devil inside of him that causes these things and ask him to help us. He gives his life to Jesus and we begin to put our hands on his shoulders and pray for him. He begins to shake and breathe out the spirits and the power of God falls so strongly on him that he begins to close his eyes and fall backwards so we lay him gently on the ground. Later we hug him and he looks like he is going to cry as his arms shoot up towards heaven in worship to God. I have never seen anything like that---where the glory of God falls so strongly that the person cannot keep their arms down. I am singing to him and he looks at me and begins to sing with me as we rock him in the love of God. He is so full of the love of God that when it is over he hugs all of us and even hugs a man who he was angry at before. I can feel God’s compassion for him so much that I begin to cry. 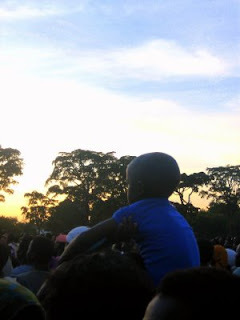 There, with thousands of people around us, we stand in a circle hugging this boy---this boy who has been rejected and is now loved, who was lost and is now found, safe in the arms of the Father. And I feel we are a part of that heaven we so long for. From the stage we hear the cry, "Uganda will lead one of the greatest revivals of our time." And I know that it is true. Jesus walking through the crowds. And I know it is only a matter of time before the wounded will be held, before the displaced will return home---not just to their own land, but to the Father’s heart. As for me…I am alone again but well. I’ll be serving with and alongside Favor of God while seeking God for strategy in how to build Zion Project. A possibility of moving in with a woman, "Mama Shekinah," who is taking in child mothers from the war into her home to do inner healing. Our dreams are so aligned so we are just praying through what God wants to do. She is an amazing woman—she is from Paraguay and two years ago she was traveling with her husband from Uganda up to Sudan when their car was ambushed and he was killed by a group of child soldiers. Mama Shekinah remembers looking up into the eyes of one of the children and realizing it was a girl and seeing the hurt and emptiness in her eyes. And God spoke to her as she held her dying husband in her arms and said she had a choice---she could forgive or she would forever carry this wound. In that moment…she forgave and she knew she would come back to Uganda to help these girls. We call her Mama Shekinah because when her husband was killed she was pregnant with their first child. 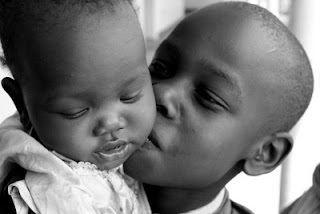 That little girl is now two years old and her name is Shekinah—"glory."